In the quest for better health, many people turn to doctors, self-help books or herbal supplements. But, they overlook a powerful weapon that could help them fight illness and depression, speed recovery, slow aging and prolong life: friends. Researchers are only now starting to pay attention to the importance of friendship and social networks in overall health. A 10-year Australian study found that those age 55+, with a large circle of friends, were 22 percent less likely to die during the study period than those with fewer friends. 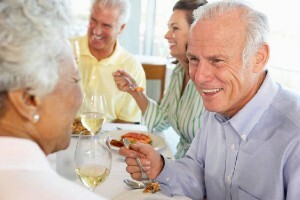 And last year, Harvard researchers reported that strong social ties could promote brain health as we age. Bella DePaulo, a visiting psycholgy professor at the University of California, Santa Barbara, whose work focuses on single people and friendships, notes that in many studies, friendship has an even greater effect on health than a spouse or family member. In a major study of nurses with breast cancer, having a spouse wasn’t associated with survival, but having good friends was. Exactly why friendship has such a big effect isn’t entirely clear. While friends can run errands and pick up medicine for a sick person, the benefits go well beyond physical assistance. Friendship clearly has a profound psychological effect. People with strong friendships are less likely than others to get colds, perhaps because they have lower stress levels. Last year, researchers studied 34 random individuals at the University of Virginia, taking them to the base of a steep hill and fitting them with a weighted backpack. They were then asked to estimate the steepness of the hill. Some participants stood next to friends during the exercise, while others were alone. The individuals who stood with friends gave lower estimates of the steepness of the hill. And the longer the friends had known each other, the less steep the hill appeared.